QUESTION 1: During your Skype lessons, should I practice what I feel I just learnt from you? Because sometimes I have the feeling that I understood what you taught me and I would like to learn more and to practice at home. QUESTION 2: How can I tell if it´s my guitar which does not tune well, or perhaps are the strings the problem? QUESTION 3: Should I be using motion of the joint of the thumb at the wrist (the carpometacarpal joint) to play a melody or series of notes or should I be using a stiff wrist and more of a motion from the elbow joint which gives more power - or are there times when both are correct? Where should my other fingers be? Resting on the guitar top for balance or touching the underside of the first string as I see in some of Paco's videos? How about the angle of the thumb to the guitar top? - sometimes I see you turn it in quite a bit and other times it seems more parallel to the strings. This week AG launched their New Generation Francisco Simplicio 1929 Model. 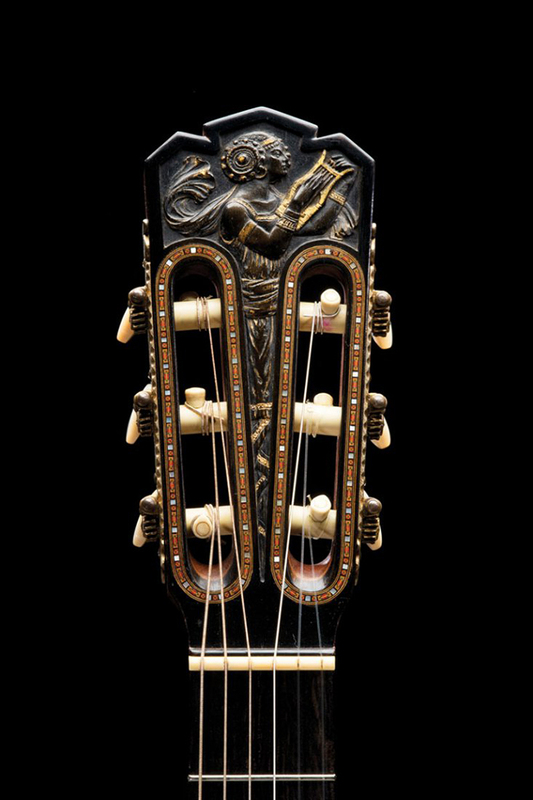 This is the head stock of the original model made by the great luthier in 1927. It's a very signifivative design! An impressive quality of sound in this Francisco Simplicio 1928 classical guitar, it prove's that he first mastered the traditional sound hole to perfection.